Localrootz Project: the Localrootz Homestead. So the years have been turning season by season, day by day and hour by hour. 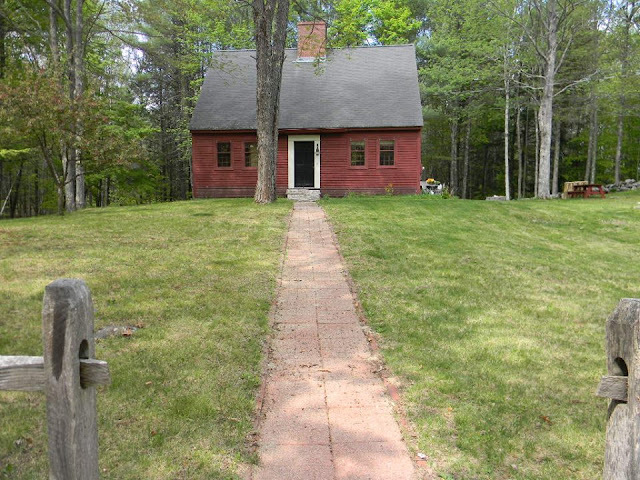 My wife Cassi and I have finally settled into our own home, nestled in the woods of Maine. The past years have been quite the learning experience as we did our best to live as sustainably and close to the land as our lives in Portland would allow. Now the new chapter has started and we have the space to really learn and create a life together that encompasses all of our passions and curiosities. Sitting here working on this new blog entry I am realizing that we really have been busy these first six months. We have so much to learn, so many dreams of what we will do with our humble 5 acres and I look forward to reacquainting with my old readers and making new friends with fellow homesteaders from New England and abroad. We moved in just in time to get two plus feet of snow dumped on us on our second day here ! We found we have quite the herd of deer that were always interested in what we were up to from our kitchen window. I learned how to move lots of snow with a shovel and also how easy many shovels are to break... three shovels broken in the first winter. 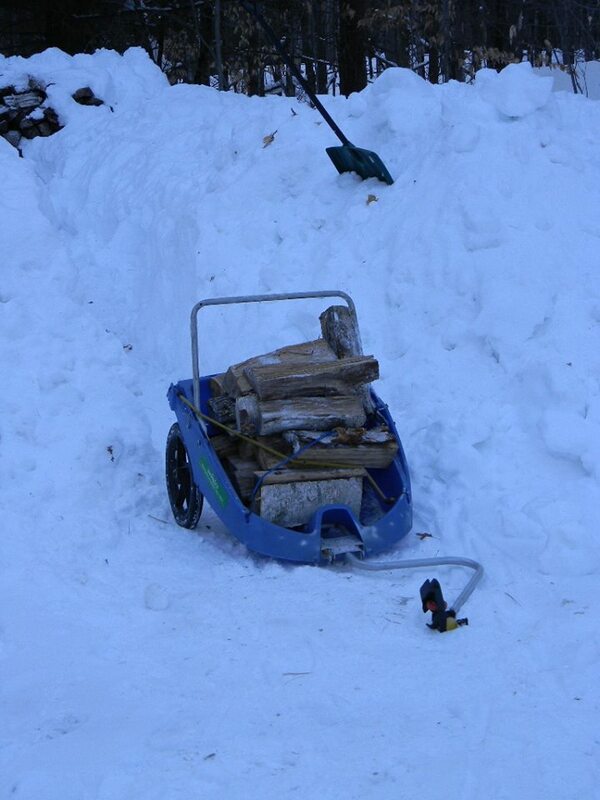 The wood pile got a bit buried and after burning through our basement stash I learned that keeping a path to the reserve woodpile maintained, is smarter than having to shovel through a four foot pack of frozen snow when your supply is running low. I also learned my old bike trailer works pretty well to cart wood to the basement, but a wheelbarrow would probably be a good purchase come spring ! 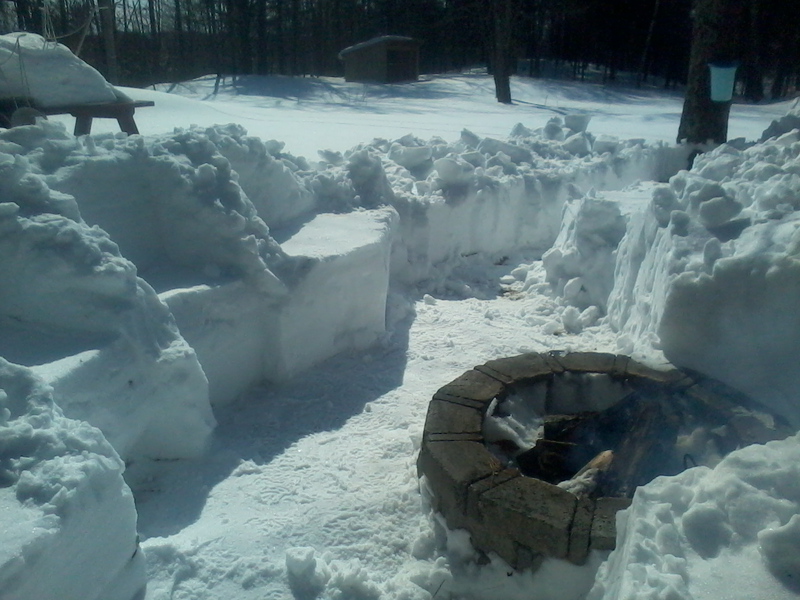 After a couple months of staring at a snow packed landscape I started getting the urge to make the best of the situation and decided we should make some maple syrup... shoveling out a path to a few of what I hoped to be maple trees and the firepit, I figured why not carve a few benches for some outdoor seating options while I was at it. As the sun started rising earlier the snow pack slowly recessed. 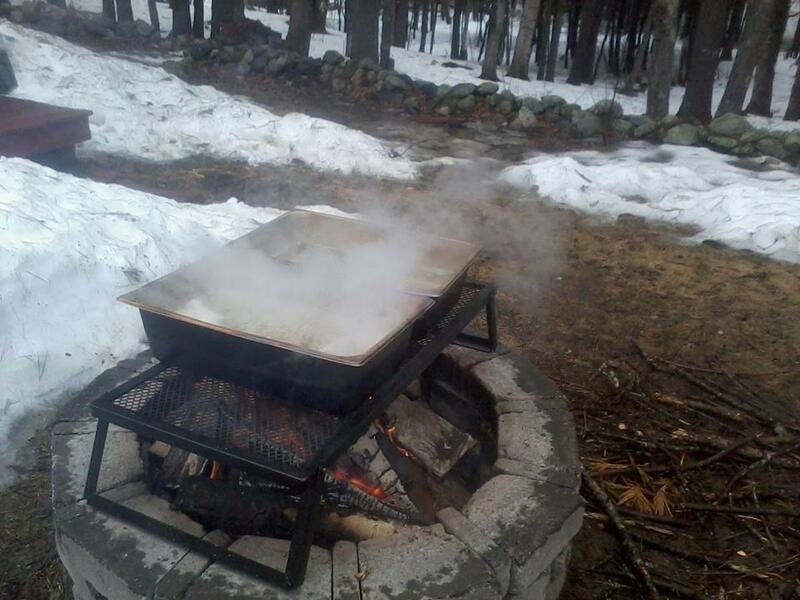 Getting the firepit ready for the second boil of the season. A couple steam pans from a local restaurant supplier worked quite well for boiling about 30 gallons in a 6 hour span... carefully topping off the pans as the water evaporated. Some good company, baked beans and a extended bottle share made quick work of the boil. Found it best to finish the process off in house on the wood fired cookstove. Localrootz Maple Syrup Batch one ! As always anything you make yourself taste better but honestly the added complexity of smokey wood from boiling on an open fire made it way more tasty than we ever expected. The constantly shrinking wood pile... I really do enjoy the process of heating a home with wood. Ask me if I still enjoy it in 2o years though ! After a couple weekend boiling sessions we ended up with just under 2 gallons of maple syrup for ourselves. About a half gallon or so was jarred up and given to friends and family but the rest is still being used on a regular basis for homemade ice cream, pancakes, cocktails and various other delicious concoctions ! After all that work we decided to celebrate the end of maple season with two of my favorite maple syrup laced beers ! Both extremely decadent and delicious maple syrup based beers that were also aged in bourbon barrels, YUM. Another much needed purchase for spring homesteading in Maine is a good pair of muck boots. These are great for those wet spring days and will be very practical when we expand our homestead to include some livestock. Speaking of livestock... this well fed turkey found its way to the bird feeder dropping outside of the kitchen window. With the ground thawing and the sun warming the ground I decided I would spend a morning seeing what type of raised bed situation I could come up with... I told the wife I wasn't going to grow anything our first year until I knew the best places to plant and got a better assessment of the landscape around us, but that didn't mean i couldn't have some fun with a hacksaw, hatchet and some blow downs I dragged out of the woods. I lined the bed with a weed blocker and raked all the old straw bedding from the goat shelter the previous owner had left behind. goats had left "behind" ! As Spring continued pushing forward we mowed the lawn for the first time... but before that happened I had to make use of the first blossoms of the season. Localrootz Dandelion Wine batch one ! I like getting a bit creative when Im cooking up some concoctions in the kitchen. Lots of adjuncts were added to the carboy including some fresh squeezed citrus, ginger and dried chamomile. In fact I should probably go rack that sooner than later now that Im looking back at when it was put into the carboy. So as I was saying to the wife, Im not planning on growing anything this year. Beep, beep, beep goes the dumptruck with 10yds of dank organic compost ! After a nice dinner with my favorite local farmer friend I didn't think 10yds would go very far but our math seemed a little off after filling the raised bed, I quickly realized I needed to make more. Lots of compost to move, got a wheelbarrow though ! A couple hard working weekends and I found a few bales of straw in the woods leftover from the goats to make one of the beds an easy build. A late planting but we eventually started getting things planted by the second week of June. All this work was done under the watchful eye of a feisty woodpecker family. Called it good at three for a start but have since built another one that will house the garlic for my fall planting. Still have a good amount of compost as you can see in the pile tarped off in the driveway. Flowers are starting to bloom and the landscape is coming alive all across our homestead. Integrating a nice little grouping of herbs in with the perennial flower bed from the previous owners who built our house. Soaking up the sun... now we need a fence before that deer herd finds our bounty ! Shed is cleaned up and tools are organized and are slowly being acquired. After seeing a bounty of fungus and mosses all around our land and beyond in the miles of woods that abuts our homestead... Im finding myself in need of some foraging resources. But I know for sure these are chanterelles and boy were they delicious ! Fence is built ! I used a temporary t-post design to ward off the deer but plan on a more permanent cedar post fence once we come up with a solid plan of where the future livestock will be located and more raised beds will be built. Trying to do everything as inexpensive as possible so made a gate that seems to be working just fine ! Summer is now in full swing as you can see from this sunflower ! Things have also gotten a bit out of control and Im seriously considering a greenhouse for next year to separate the tomatoes as they have gotten a bit out of hand even pruning them once a week or so ! The cages proved to not do a whole lot once they got 6 feet tall and a good thunderstorm gave them quite the lean and pulled the cages with them. Definitely the best cabbages we have grown to date. Eggplant, cukes, chard and peppers are doing very well in this bed as well ! Some of the summers bounty so far... finally after weeks of just picking what we needed for dinner we had to just pull a BIG harvest and stock the fridge. Such perfect produce ! So excited that the season has gone so well considering the late planting. Stashing some fresh greens into some freezer bags for some summer memories when the cold weather comes back. Stay tuned for more from the Localrootz Homestead.